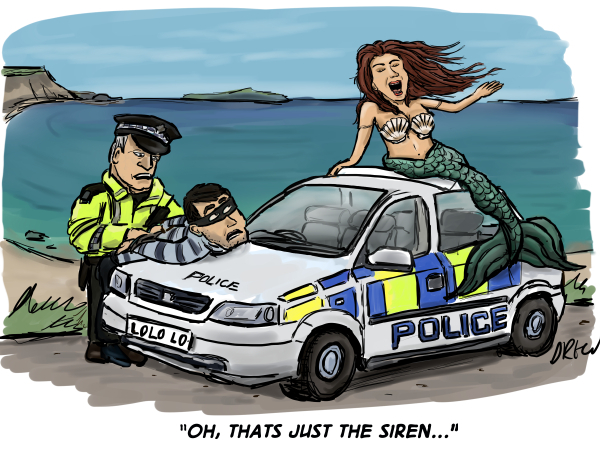 This week I had to do a cartoon on the police but I was thinking about mermaids because of the Australian kids series H20 and so I came up with this. It's not the best or worst pun I've entered in the competition, my favourite groaner would be this one about King Kanute. Of course sirens and mermaids are not exactly the same except in the popular imagination. Sirens in some mythology were more a mashup of birds and women, and they lost a sing-off with the Muses and in the Homer's blockbuster The Odyssey the heroes had to put wax in their ears to ward off their songs. Mermaids didn't originally sing until recent books and films. Finally if your view of mermaids comes from the Disney film The Little Mermaid it is way different from the original darker Hans Christian Anderson book.